Danny Brough agonisingly missed a late conversion as Warrington held off a Wakefield comeback to win 34-32 at the Mobile Rocket Stadium. Four tries in 13 minutes in the final quarter threatened to usurp what had been a 22 point deficit, but Brough’s final conversion shaved the wrong side of the post and in a dramatic finale, Warrington just held out. Man of the match Blake Austin entered the season as the heavy favourite for the Man of Steel award, and while he may not necessarily be grabbing the headlines, he is quietly showing his quality. Whether it is his leadership in defence, his kicking game or the blistering run that got Warrington on the front foot in the second half, he is head and shoulders above Tyrone Roberts from last season, and you get the feeling that Austin has something saved in his locker for the big games, and perhaps the finals, that the Wolves have been struggling to win in recent years. If you could pick one player to have a go at that conversion at the end, Danny Brough would have been right up there. He was honest in his post-match interview, that the difference was he missed two, whereas opposing kicker Stefan Ratchford nailed seven from seven. It shows the value of a good goalkicker, and shows the Wolves were correct to take the two points on offer from penalties either side of half time. Two consecutive top five finishes, an exciting team and now ownership of their Belle Vue ground. If Wakefield can get the re-development going as they hope, then what an exciting time to be a Trinity fan. 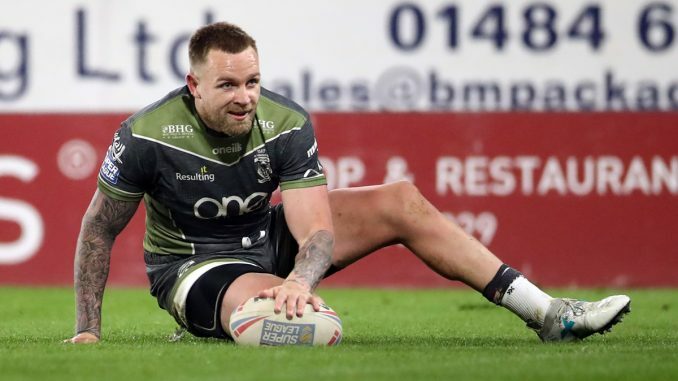 Even without three of their finest players, they’ve pushed one of Super League’s best all the way, and they are certainly going to be in and around the play-off picture. Wakefield: Hampshire, Jones-Bishop, Lyne, Arundel, Jowitt, Miller, Brough, Fifita, Wood, England, Pauli, Horo, Crowther. Subs: Arona, King, Kopczak, Hirst. Warrington: Ratchford, Charnley, King, Atkins, Mamo, Austin, Patton, Hill, Clark, Cooper, Currie, Hughes, Philbin. Subs: J Clark, Tasi, Murdoch-Masila, Walker. A pulsating finale to what had looked like being a comfortable Warrington win at varying times of the game. The atmosphere and excitement generated in that final quarter by Wakefield, who refused to give up, was Super League at its best. While Belle Vue perhaps isn’t the best advert for Thursday night live on TV, what a huge coup for the club to regain ownership, and as they continue on the crest of a wave thanks to their on-field performances, if they can press on with the development that will be a huge off-field positive. Steve Price will have wanted his Warrington side to have put a message out at 34-12, when they could have even gone top of the table, but instead he’s facing a wake up call, and no doubt a timely one as they prepare for Hull next weekend.